Every day in Mexico it is increasingly dangerous to be a journalist. 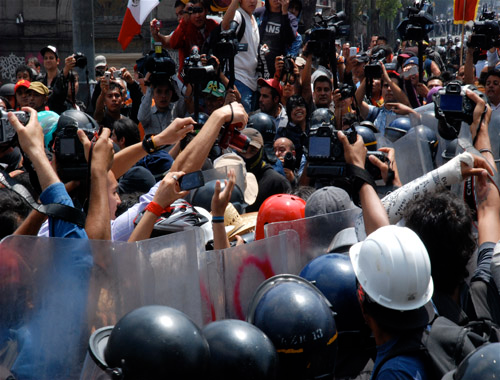 During protests or events criticizing the Mexican government, public security forces often take or even destroy journalists’ equipment. According to a list published by the Committee to Protect Journalists (CPJ), Mexico is among the top twelve countries in terms of impunity for the murder, disappearance, and abuse of journalists. Update: Gustavo Ruiz has been released. Journalists are beaten and arrested by police in Mexico City for doing their job. They are sentenced for alleged crimes such as disturbing the peace, the production and transport of potential weapons materials, possession of toxic and flammable substances, when in reality they are only using the equipment necessary to do their job. A member of Agencia Subversiones (Subversions Agency, an independent media outlet), Gustavo Ruiz, recorded his own arrest, which occurred after he asked the police a question about the arrest of individuals protesting the passage of an education reform made to the Mexican Constitution (the Organization for Economic Cooperation and Development (OECD) had recommended the reform to Mexican President Enrique Peña Nieto.) The police did not respond and instead arrested, beat, and dragged him until one of his colleagues and fellow member of Subversiones was able to grab his video camera. Gustavo was arrested for simply asking why detainees, including a fellow reporter, were being taken at that time. His colleagues shouted to police, “He’s a member of the press! He’s press!” and tried to help, but he was arrested anyway. Gustavo’s colleague who had managed to grab his camera also noted the description of the vehicle in which he was taken, and then rejoined the rest of the team. They immediately uploaded the video to the internet as proof of the injustice. A request was then issued to other human rights NGOs and alternative media outlets to follow the case, knowing that, as in previous cases, the consequences could be dire, including torture, disappearance, or death. The response was immediate and overwhelming. Being a journalist in this country is dangerous, but as an independent journalist one is even more vulnerable. Even if they don’t document the war, there are many reporters that still have to take strict security precautions. Many have attended workshops and courses for war correspondents, since in the context of Mexico’s war there is no real security for those in this profession. The Subversiones team held a meeting the night before Ruiz’s arrest to talk about the possibilities of what could happen the following day. They realized that many of them could be arrested or injured, and this prompted them to launch their security and mobility protocol. They understand the legal and political tools at their disposal, even down to the length of time someone can be detained, and that everything depends on how quickly they move within the bureaucratic process. As this article went to press, the video Ruiz recorded had almost twenty thousand views in just four hours and has been picked up by other independent and mainstream media outlets. This has generated calls for solidarity in different parts of Mexico and abroad. Óscar Montes de Oca, Mexico City’s Assistant Attorney General, confirmed in an interview with media outlet MVS that those who were arrested had press credentials, but that the government was still investigating whether or not they were actually members of the press. Ruiz has been charged with disturbing the peace, impeding the legitimate exercise of authority, possession, manufacture, and importation of potential weapons, and resisting arrest. The charges carry a minimum sentence of at least two and a half years in prison or a fine of between $2-3,000 (USD). Ruiz’s colleagues, along with collectives and organizations, are fundraising money to pay the fine. There are also independent lawyers available who work pro bono or who receive a symbolic payment in exchange for their assistance. Article 19, an independent organization that promotes the defense of human rights, freedom of expression, and the freedom of the press, has been following the cases of journalists who have been arrested. They have called upon Mexico City authorities and police to respect journalists’ work, as it is important to cover these events to make sure that law enforcement carries out its duties properly and refrains from excessive use of force. At the same time, Subversiones has circulated a statement asserting that the individual they consider to be directly responsible is Mexico’s president, since he is the one who issues such orders. The declaration has received overwhelmingly positive response from journalists, intellectuals, artists, and organizations, many of whom have signed on. This is an indication that there are many in the field who are tired of not being able to do their work freely. The current context has not only generated outrage among collectives, organizations, and journalists, but has also resulted in proposals for the immediate launch of workshops, talks, and spaces to exchange experiences. The Subversiones team has been working long hours since the arrest of Gustavo and the other journalists. The team’s exhaustion is apparent, but they are doing everything within their power so that their colleague is promptly released and can continue with his daily work. They consider this to be an unfortunate part of their job, but they hope that in the future their working conditions will improve.